As the world becomes more urbanized, the importance of supporting robust ecosystems within our cities grows. Increasingly, urban farms are providing that service, acting as leverage points for positive ecological and social change. Over the past several years, Regenerative Design Group has been fortunate to partner with innovative clients in the Pioneer Valley and Boston metro area, helping to envision, design, install, and maintain a variety of urban farms. 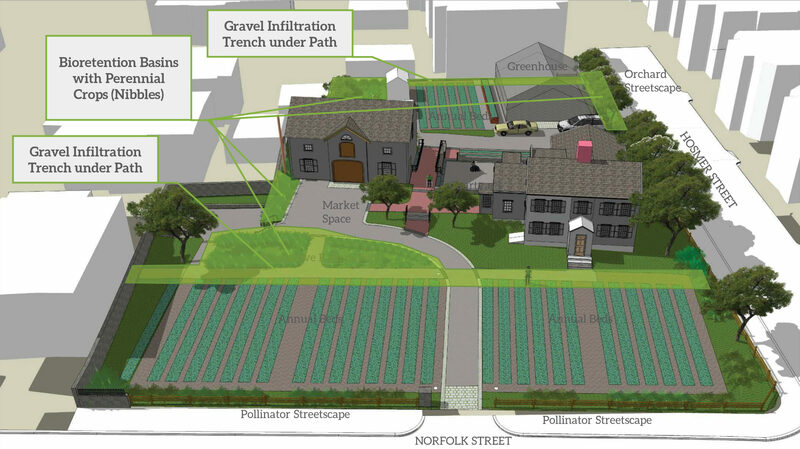 These projects are arrayed across the urban transect, from Fowler Clark Epstein farm in the Boston neighborhood of Mattapan, to Gardening the Community’s Walnut Street Farm in Springfield, to the Florence Organic Garden run by Grow Food Northampton. 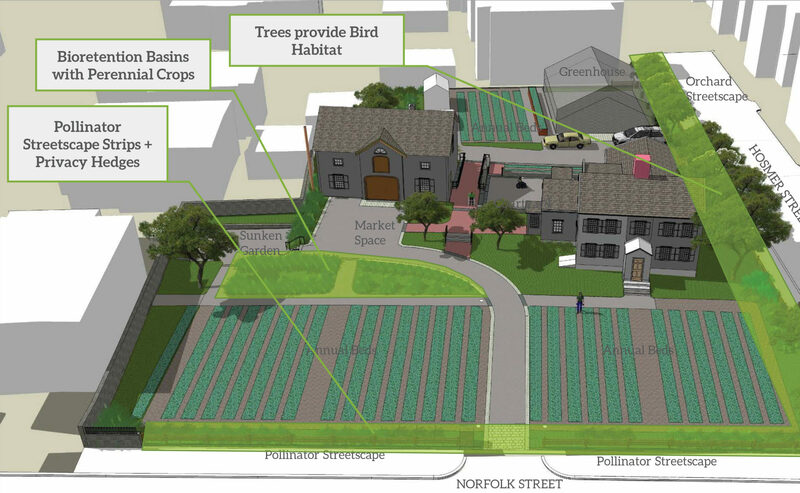 Each of these farms produces a constellation of benefits for humans, flora, and fauna – and mitigate some of the harmful consequences of conventional urban landscapes. 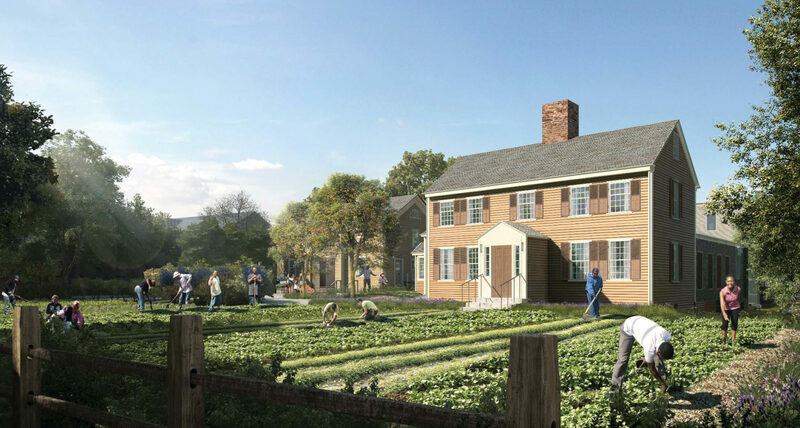 Fowler Clark Epstein Urban Farm – rendering by Silk Road for Perkins + Will. A recent study in Germany documented a precipitous decline of flying insect populations within protected natural areas across the country. One might assume that pollinators would find safe haven in parcels of land that have been set aside specifically for wildlife protection. Over the last three decades, according to the report, pollinator populations have dropped in these areas – by 76% overall and up to 82% during summer months. These numbers are representative of declining bee and pollinator populations worldwide – frequently known as “colony collapse” – a phenomenon likely due to the increased use of high-potency agricultural pesticides in nearby farmland. Surprisingly, additional studies in Europe indicate that urban landscapes can actually maintain pollinator populations of equal size to those present in conservation land. The heterogeneous nature of cities, especially those dotted with farms and gardens, offers a diversity of forage and habitat necessary to sustain pollinator insects. In fact, bee diversity in particular was higher in cities than areas of conventional agriculture. For these reasons, each urban farm we design includes significant plantings that feed and house the bugs that make pollination possible. In our design at Fowler Clark Epstein we incorporated a “buffer” of fragrant, bug-delighting plant varieties to provide a transitional palette of color and insect activity between street and farm. These buffers can easily be replicated in front yards, back porches, or even the humble window-ledge container garden. Fowler Clark Epstein: Pollinator overview. As urban populations expand globally (from 746 million in 1950 to 3.9 billion in 2014, according to the United Nations) urban farms and gardens are critical for welcoming and supporting the pollinators we rely on for our food supply. In an ideal world, damaging pesticides would be phased out quickly and fully, allowing pollinator populations to rebound. 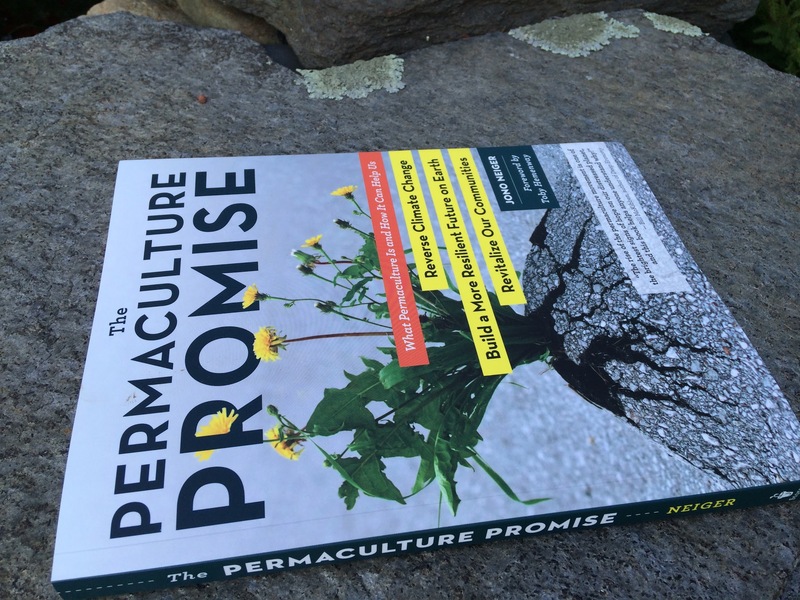 We live, however, in a world where the norms of industrial agriculture are likely to maintain a detrimental influence over our agricultural landscapes for years to come. In this context, growing gardens in the city is an opportunity for individuals to provide a much-needed reprieve for our insect allies. When rain hits the streets, sidewalks, rooftops and other impervious surfaces of the typical city landscape, it picks up harmful substances before being quickly shunted into the sewer. From there, stormwater is diverted either to the wastewater treatment facility (at great expense to the taxpayer) or runs into the nearest water body (at great expense to wildlife). As large storms increase in the Northeast due to climate change, so does the burden on our wastewater treatment systems and our urban waterways. An urban farm provides an opportunity to capture rainfall from a storm, filter it through the soil, and allow it to infiltrate into the ground. Depending on the needs of the site, this infiltration can be accommodated in a variety of ways. In Boston, it is now mandated that all new site construction infiltrate the average rainstorm on site. Per these regulations, at Fowler Clarke Epstein we designed a highly engineered system of gravel paths that serve double-duty as infiltration basins to accommodate a 1” rainstorm. Alternatively, at the Walnut Street Farm run by Gardening the Community in Springfield, rainwater infiltrates through the garden beds, along with a number of low-tech rain gardens distributed throughout the site. In this way, stormwater is turned from a costly problem into a high-yielding resource. Fowler Clark Epstein: Stormwater management overview. Cities offer endless opportunities for dynamic placemaking. Through collaborative planning, design, and management, placemaking projects like urban farms strengthen the bonds between people and the places they share. At Fowler Clark Epstein, the history of place is being preserved and celebrated. Through our participation in the project, we have come to understand the monumental effort it takes to restore the vitality of a historic homestead within the city. Admittedly, it would have been much “simpler” to demolish and start anew. But then the neighborhood would have lost its priceless sense of place. Similarly, at the Walnut Street Farm in Springfield, Gardening the Community has created a one-of-a-kind location. Where once there was only an overgrown lot, there is now a place for community, job training, food, and collaboration. 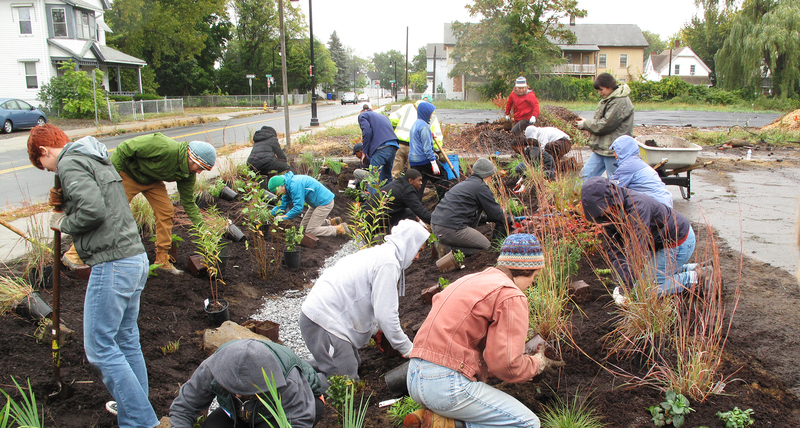 Volunteers installing a rain garden at the future site of Walnut Street Farm in Springfield. An urban farm is a celebration of a neighborhood’s potential to grow food, to gather together, and to learn from one another. An urban farm is an oasis of green, where a diversity of people can connect with nature. 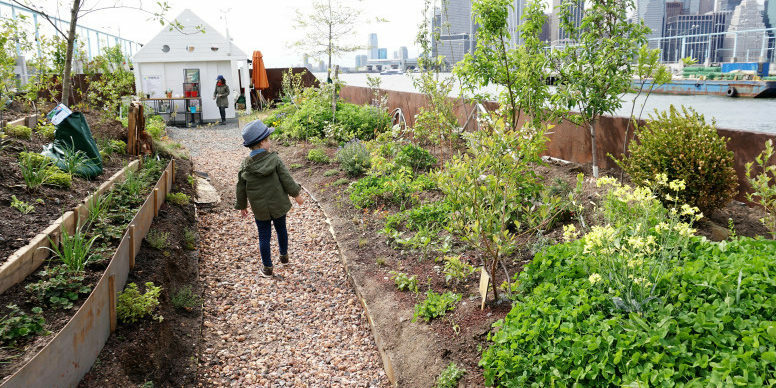 An urban farm is an adventure playground for children, full of dirt and “loose parts”. An urban farm is a space for restorative justice, where people who share a history of exploitation can reclaim a healing relationship to agriculture. 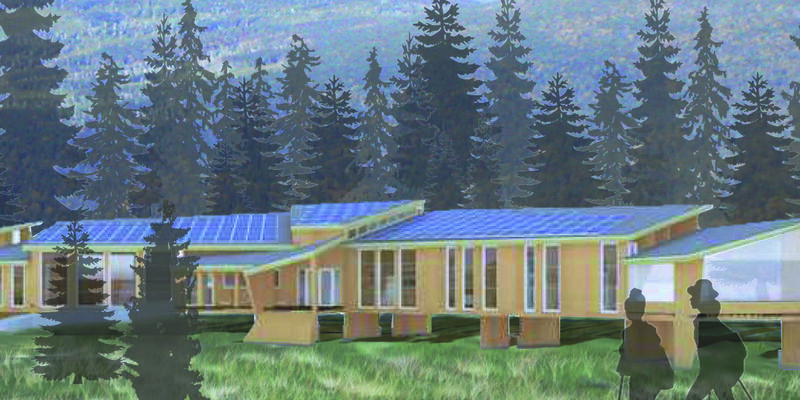 An urban farm is a communal hub, a place to host meetings, potlucks, hoedowns and shindigs. A urban farm is, above all, a place to celebrate life.